At the end of the final Super Smash Bros. Ultimate Direct, a cutscene from the game's World of Light singleplayer mode was shown. 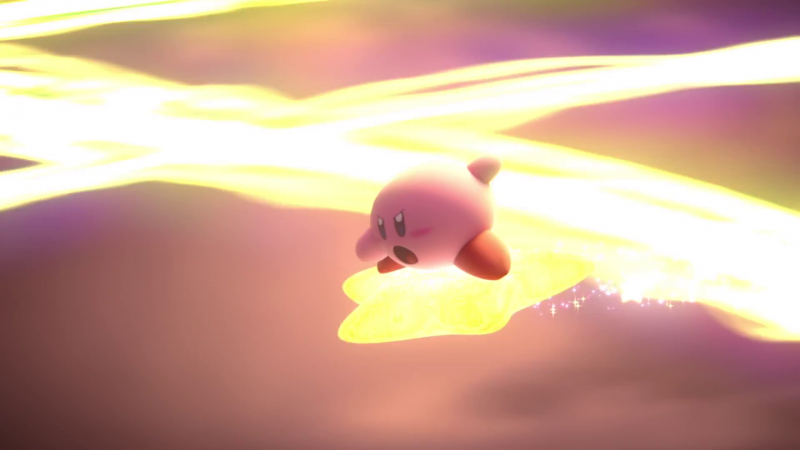 In the cutscene, almost everyone dies, except for the pink puffball Kirby, who managed to use the Warp Star to teleport out of the galaxy before it is absorbed by the formless Galeem. It was long suspected that director Masahiro Sakurai chose Kirby to survive, and thus start off the World of Light mode, because Sakurai created Kirby when he was at HAL and thus maintains some preference for the character. Not so, says Sakurai. In a column for Japanese magazine Famitsu, translated by Source Gaming, Sakurai dismisses the idea that his own bias for the character contributed. Instead, it was actually a lore-dependent decision sprinkled with some gameplay considerations that lead to Kirby being the best choice. "We needed a solid, convincing reason for why said character could outrun Galeem," Sakurai wrote. "All fighters possessing 'normal' abilities were immediately disqualified. Given that its assault enveloped the ends of the galaxy, only a vehicle that could defy the laws of physics would work. Even short-distance teleportation wouldn’t be enough. Some of you may have forgotten, but Kirby’s Warp Star has been able to, y’know, warp since his very first game. That alone made him a pretty solid contender. The only other two fighters that could have survived would have been Bayonetta or Palutena." Sakurai reasoned that Bayonetta and Palutena's enemies are in World of Light mode, so they were captured, meaning it was unlikely that these two characters would have made it. But the bigger consideration is that they are much more complicated characters than Kirby, who has been around since Super Smash Bros. on the Nintendo 64 and has not changed a great deal since. For new players, taking control of either the witch or the goddess as their first interaction with the game would have been overwhelmingly complicated. In the column, Sakurai noted that Super Smash Bros. Ultimate will receive a day one patch, though he did not indicate what it would include. He also confirmed that, for the first time in the series, Ultimate will be able to save replays as videos rather than a log of button inputs, meaning they won't be broken by balance updates.